Metering systems and systems for oiling are used in assembly applications for the defined semi-automatic or fully automated application of oil as a lubricant on mechanical components and assemblies. Lubricant application is typically performed in conjunction with assembly operations. The assembly is frequently combined with a subsequent mechanical function test for quality assurance. Typical products are metal components for mobile electromechanical assemblies. The lubricant is used to reduce friction and wear on friction components in mechanical assemblies. Low and high viscosity media can be applied with dosing devices for surface, contour line coand point application. Dosing systems include a media supply and systems for conveying, dosing and applying the lubricants, including the required handling technology. They are available as manual systems, table stations as well as special machines. The medium is supplied with low-viscosity lubricants by pressure vessels or drum pumps; high-pressure drum pumps are used for high-viscosity media such as greases. In addition, heating may be required. The media is conveyed in hoses or pipelines, monitored for pressure and / or flow rate, and controlled by the control with the aid of pressure reducing or compensating valves. 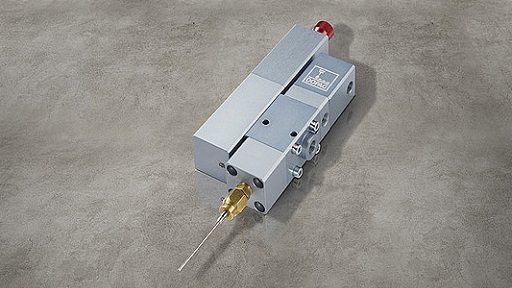 A dosing and application device is used to apply the media to the components. In this case, either the workpiece is fixed and the dosing head is moved to the lubrication points by means of a handling system, or the workpieces are handled under a fixed dosing head. The media output can regulate the discharge time, pressure, mass or volume. The application is carried out with low-viscosity oils via an outlet valve, a spray valve with air atomization or with metering valves. Furthermore, the application is provided with a valve needle or special greasing heads.